Waupun celebrates with the Class A state championship trophy in Osseo on July 31 (Photo courtesy of Osseo baseball). 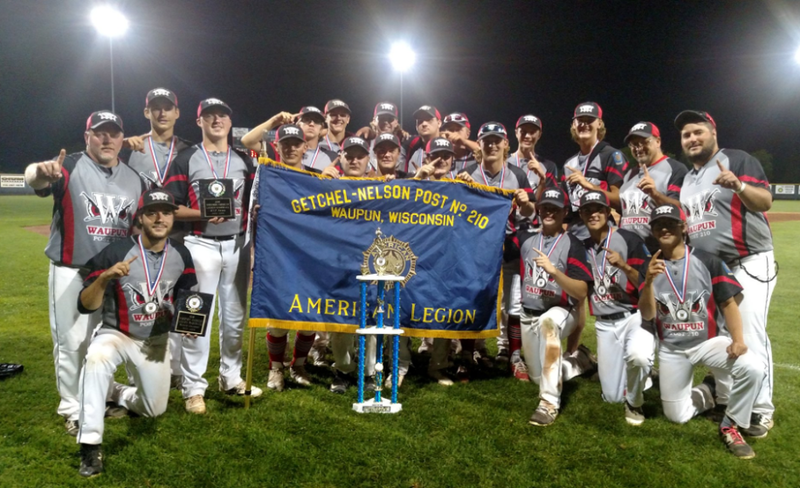 OSSEO — Waupun Post 210 used an early surge to defeat Fennimore 8-2 for the Legion Class A state championship on Tuesday at Merchants Field. Waupun (25-4) scored two runs in each of the first three innings, and got 11 strikeouts from ace Brenden Bille on the mound to win the championship. It's the second major championship of 2018 for Waupun, which also won the WIAA Division 2 state title in June. Post 210 jumped out in front in the bottom of the first on a two-RBI single by Caleb Sauer, and added two more in the second on RBIs by Jak Lenz and Jarrett Buchholz. Fennimore (25-6) cut the lead in half in the top of the third with back-to-back RBI singles from William Ahnan and Jordan Williams. RBI doubles by Waupun's Caden Bronkhorst and Nate Brown in the bottom of the frame negated those two Fennimore runs though. Bronkhorst added a run with a sacrifice fly in the fifth, and Keegan Hartgerink completed the scoring with an RBI single in the sixth. Bille pitched 6.2 innings for Post 210, scattering five hits and allowing two runs. Lenz finished 4-for-4 for Waupun. He has played in three state championship games in the last two years, and has gone 9-for-11 in those contests. Both Waupun and Fennimore will play in the Division 2 Central Plains Tournament in Wahpeton, North Dakota, later this week. Waupun will be looking to win an unprecedented third major championship in one year. West Salem won the WIAA Division 2 state championship and the Legion Class A state title last year, and finished as runner-up at the Central Plains Tournament. Fennimore has gone 44-12 since the beginning of the high school season this year, and will look to cap an outstanding season by bringing home a trophy at the national level. Fennimore defeated Osseo 16-3 in the first game of the day at Osseo on Tuesday to advance to the title game. Post 184 was powered by some huge games at the plate up and down the lineup. Trey Hunt and Larry Moore had three hits apiece, and Jake Adkins drove in three runs. Hunt also pitched a five-inning complete game.